Rev. Jesse Jackson and the Rainbow PUSH Coalition led the protest and rally, which started at 2 p.m. on State and Van Buren. The group of about 100 to 200 people chanted "16 shots and a cover up" and counted to 16, the number of times Chicago Police Officer Jason Van Dyke shot McDonald. Protesters ended the march at the Thompson Center and held a rally, calling for the resignation of Mayor Rahm Emanuel and Cook County State's Attorney Anita Alvarez. Northbound State Street at Van Buren was closed to traffic during the protest. No arrests were made, according to Chicago Police News Affairs. Dashcam footage showing the fatal shooting was released to the public in November. Officer Van Dyke was charged with first-degree murder. On Saturday, protesters gathered along Michigan Avenue, with some staging a "die-in" outside Nordstrom, calling for the resignation of Mayor Rahm Emanuel. Participants chanted "16 shots and a cover up." Jackson and several community activists and church leaders organized another major protest on Michigan Avenue on Black Friday, a few days after the dashcam video was released to the public. The Black Friday demonstration drew hundreds of protesters and shut down the Magnificent Mile at the height of shopping time. During that demonstration, protesters attempted to block store entrances at Neiman Marcus, Tiffany & Co., Victoria's Secret and Macy's. Four people were arrested during the protest. 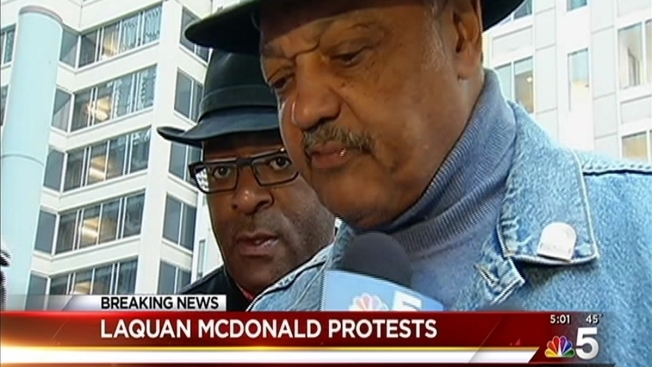 Since the Black Friday protest, Mayor Emanuel fired Chicago Police Supt. Garry McCarthy and demands for the resignation of Cook County State's Attorney Anita Alvarez have grown. Jackson was among those who asked for McCarthy's resignation, but he says the former superintendent's firing is not enough to fix the "cultural crisis" in the Chicago Police Department. "It does very little if you change the head and you don't change the heart and infrastructure. That's not enough," Jackson said before McCarthy was fired. "It must be an all-out inclusive search if he were to step down and a plan to detoxify the police and regain public confidence."